I’m such magical packaging can you even deal? I’ve been wanting to get my hands on a few Lime Crime products for a while. 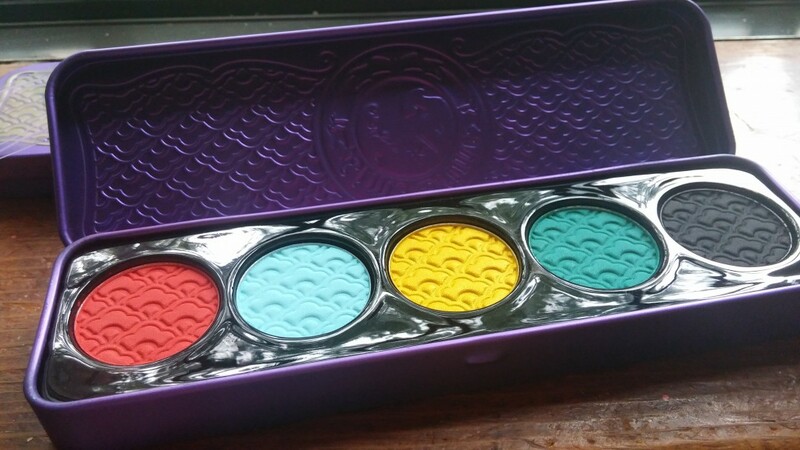 I’ve read these amazing reviews about these palettes and pigment on these eyeshadows always seemed outstanding. I knew I could only be strong for a limited amount of time until I purchased some of them and then I did. Unfortunately, these three eyeshadow palettes are no longer on the Lime Crime website. However, you can still find them around and about on the Internet, eBay, Amazon… AND Lime Crime does have the Venus palette which is the next one I desperately need because that baby is gorgeous. If the eyeshadows on the Venus palette anything like on these three palettes then it’s a must have because these eyeshadows are amazing! 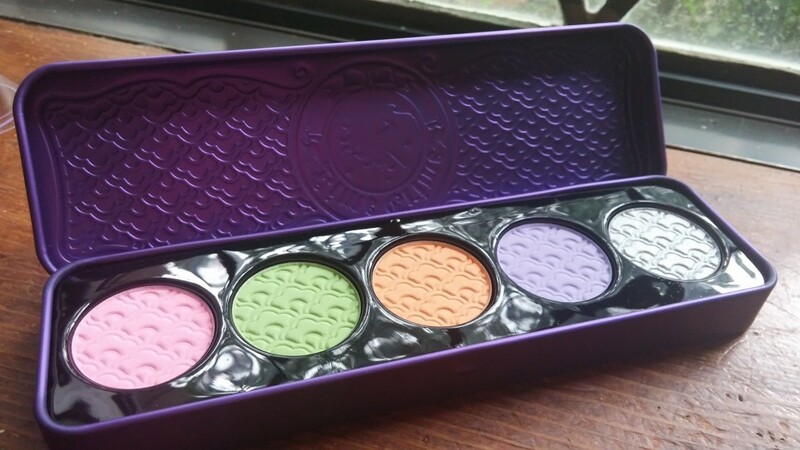 This one is Lime Crime’s Amethyst palette. It’s similar to the D’antoinette but is more of a shimmer palette. My face rocking the Alchemy palette. 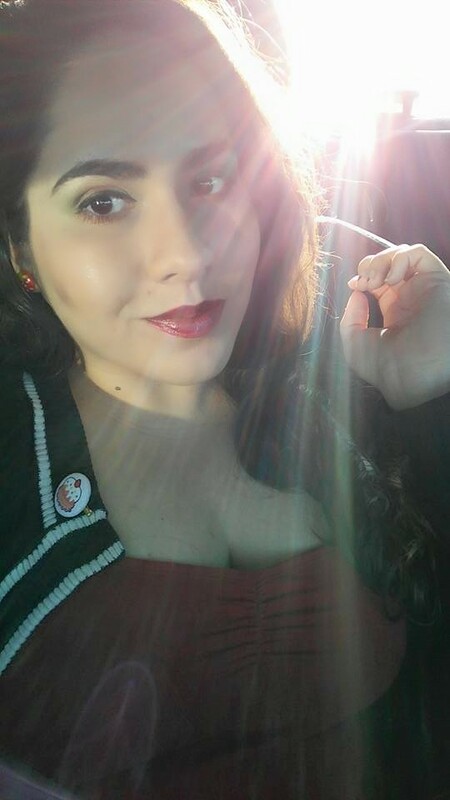 The sun was approving my eyeshadow choice so intensely that it had to sparkle sparkle my pic. 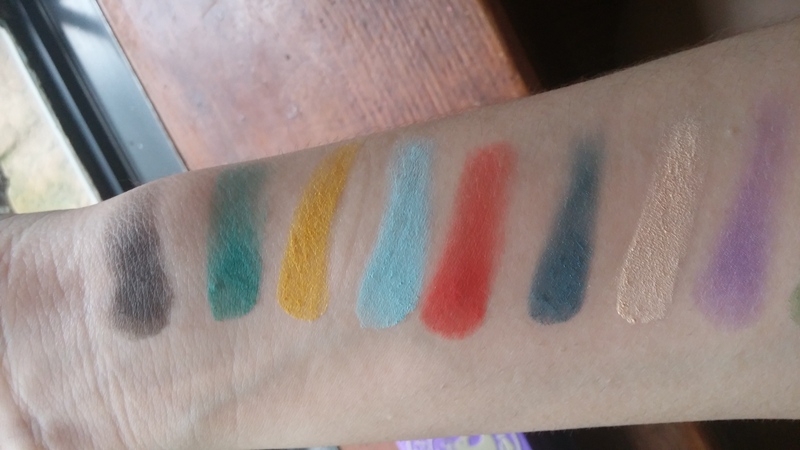 Look at these lovely swatches! They look good here but omg, I promise you they look SO much better in person. This was a simple swatch too. Not like double or triple finger swatch. Lime Crime’s Amethyst palette is the one I’ve been using the most. I love the shimmer. Each color has a name from left to right we have: Incantation, Lucky Charm, Love Potion N 9, Spellbound, and Divination. My favorites are Incantation the orange copper color, and my second fave is Lucky Charm that gorgeous sparkly gree, closely followed by Spellbound I legit use all over my lid. It’s the perfect match for my skin tone, y’all. 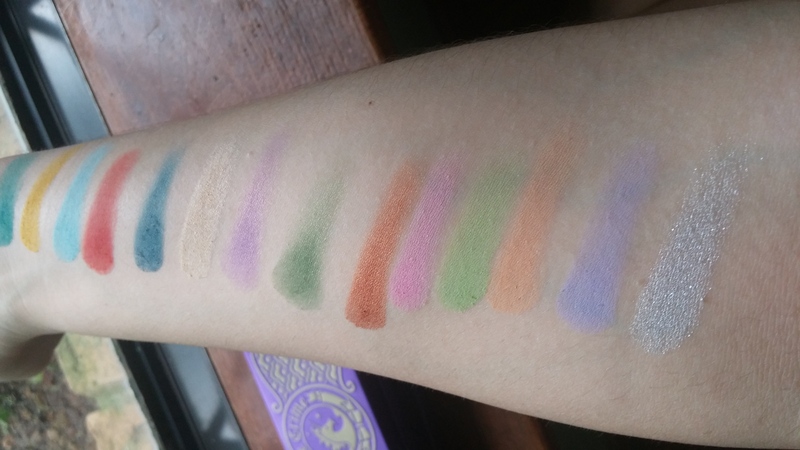 And to be entirely honest, these swatches look so much better in person. I swatched these and they’re just absolutely stunning. I think this one is my favorite palette. It’s Lime Crime’s China Doll. I know. 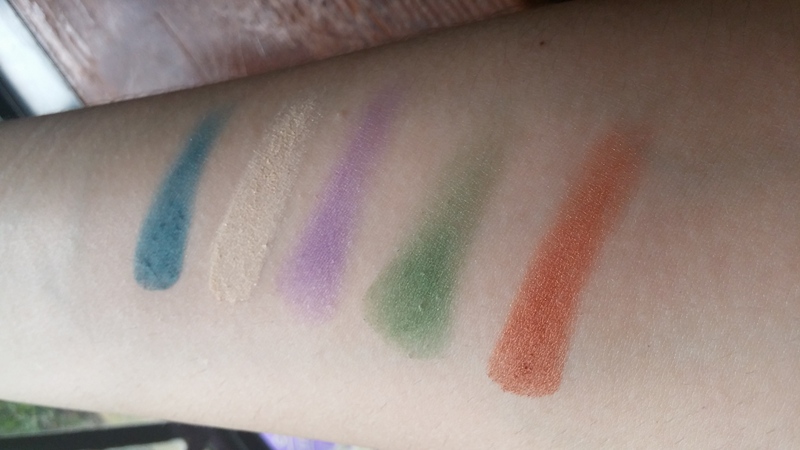 My jaw dropped too when I swatched these. I can’t even. Perf. Perf and a half a perf. These are stinkin’ magic. 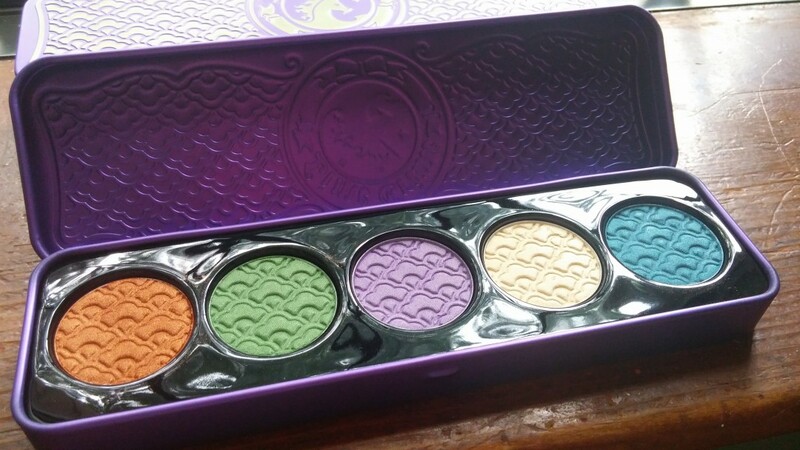 This palette is too pretty for words. I love the colors. The red and gold ones just make my hands get all grabby hand and I want to just cover my entire body with it. They’re beautifully pigmented and work even better with primed eyelids. I tried both ways but these eyeshadows (all three) look increasingly better with primer. The name for these lovely pots are from left to right: Fly Dragon Flay, Parasol, Goldfish, Jade-O-Lade, and Lotus Noir. That Goldfish, though. I cannot get enough. I feel that the D’antoinette is so incredibly perfect for Spring and Summer. The colors are just gorgeous. They’re pastels so I was worried they wouldn’t be as pigmented as the others. I was dead wrong. These eyeshadows are just as pigmented and long lasting as the other two palettes. The names of each pot from left to right are: Royal Flush, Absinthe-Minded, Macarooned, Ribbonesque, and Mercurious. The top one bottom one are China Doll’s swatches the middle one are Alchemy ‘s, and last but not least, we have D’antoinette which I want to marry. Okay, so I want to marry all of these. Don’t judge me. Get off my back! The colors in these different palettes are great! Right? I think they’re really bright and fun! Lime crime colors aso so fun! I like china doll and the pastel ones. They are! I was in awe at how pigmented they were. Plus, no fallout is my favorite thing ever. 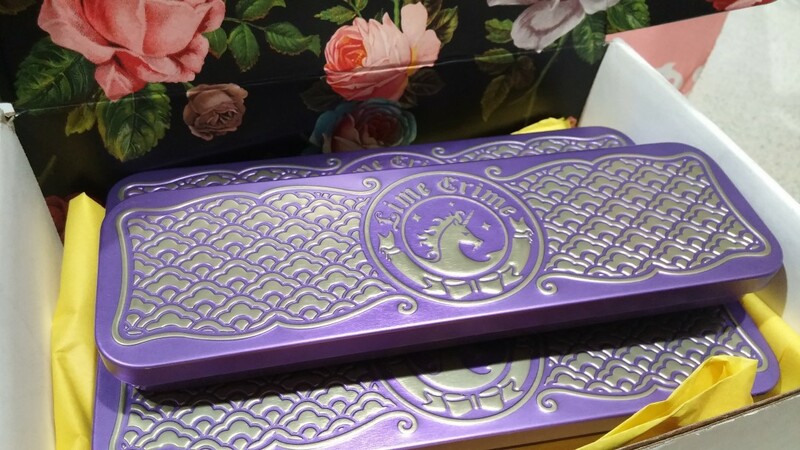 I love the unicorn boxes too!